LIVERPOOL, England — Manchester City disproved the old adage last season that the Premier League title race is a marathon and not a sprint. Pep Guardiola’s team were so far ahead of the rest last year — they won by 19 points in the end after amassing 100 points — that it was a procession rather than an arduous slog to glory. It will be a different story if they retain the title this time around, though. 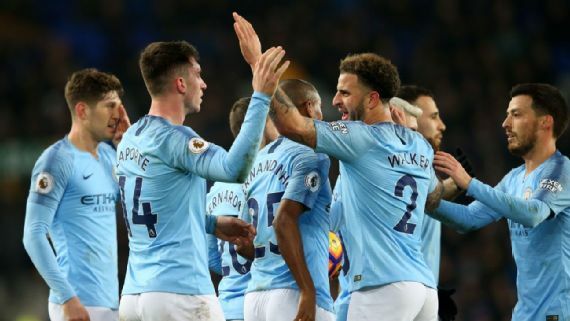 City’s 2-0 victory against Everton at Goodison Park on Wednesday took the reigning champions back to the top of the table, moving them ahead of Liverpool on goal difference, albeit having played one more game. But it was an ugly win, displaying little of the flair that accompanied last season’s title success. None of that will matter in the final reckoning, however. This season’s Premier League title, from this point on, will be decided by substance over style, and right now, City have the edge over Liverpool. Guardiola even hinted after this win that the challenges of this year’s title race are much more demanding than those a year ago. “I don’t know how far we will get — maybe we will die in the road,” Guardiola said. “But we are trying. We have played one more game than Liverpool and it’s good to be top, but Liverpool has a game [in hand against Manchester United] at Old Trafford. We are not at the run-in stage yet — early February is still midseason — but both City and Liverpool are showing signs of fatigue, physically and mentally. Neither are performing as well as they did in the first half of the campaign. Liverpool have dropped more points in the past six weeks than they did between August and the end of the December, and City are still counting the cost of their surprise 2-1 defeat at Newcastle last week. Opponents are now going into games against both title chasers believing they can emerge with at least a point, and that is also having an impact on both City and Liverpool, who are having to work harder than ever to secure victory. This week alone, Liverpool have been held to a 1-1 draw by West Ham at the London Stadium in a game that Jurgen Klopp’s team could easily have lost. And City, although they won at Goodison after beating Arsenal 3-1 at the Etihad on Sunday, were heavy legged and unconvincing against Marco Silva’s struggling team. The big difference, though, is that they overcame a poor performance to win all three points. Liverpool could not do that at West Ham, just as they couldn’t get the job done at home to Leicester during another 1-1 draw last week. City had more players involved in the latter stages of the World Cup than Liverpool, but that may be balanced out by the experience within the squad when it comes to winning major trophies. Guardiola’s players are tried and tested over course and distance. Liverpool, meanwhile, have won just one trophy this decade and their players are more accustomed to finishing second than first, and that cannot be regarded as a positive. Guardiola admitted after this game that City will “drop many more points,” and Liverpool, in their current form, look like they could do the same. Coping with fatigue could be the key to this title race, and by winning on an off day at Everton, City suggested they are best equipped to do that. They have a deeper squad and the knowledge that comes with winning titles, and that was evident at Goodison Park.